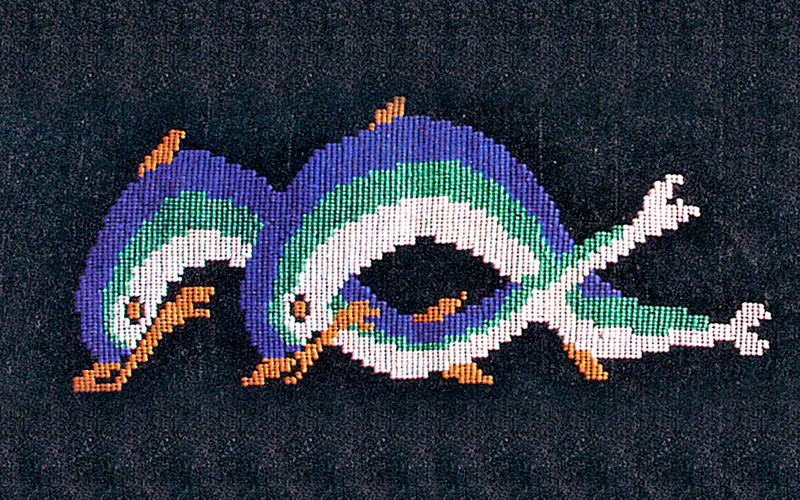 Hem detail from woven skirt, decorated with Delian dolphin motif, from the collection of Frasko Monogiou-Syrianou. The everyday clothes crafted by the island’s women caught the attention of visiting couturiers and celebrities and launched a cottage industry that endured for 25 years. What Heidegger saw that day was, in fact, part of a very long tradition. Archaeological finds from Mykonos and the neighboring islands of Delos and Rhenea tell us that, even in ancient times, textile weaving here was extremely sophisticated, as indeed it was in other parts of Greece. As the centuries went by, the custom remained strong here. 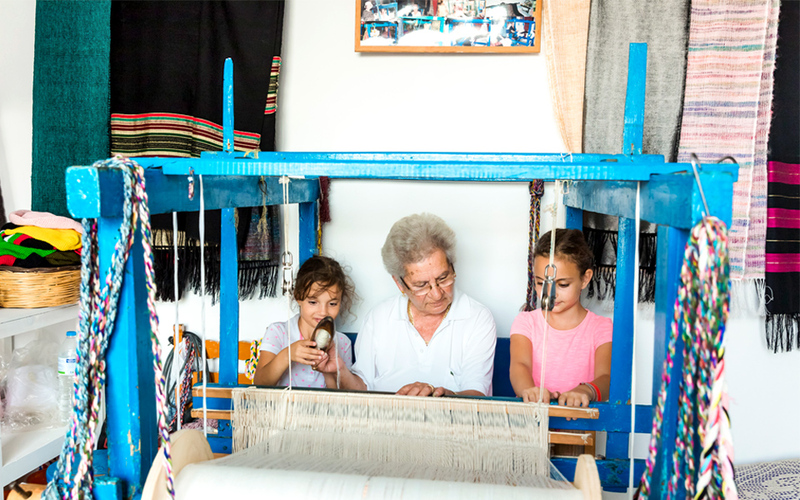 The women of Mykonos would spend hours at their looms every day, creating their family’s wardrobe, household linens and other necessities, and enriching their daughters’ dowry chests – in addition to all their other household chores. It was not an easy life. The shop of Vgenoula, a famous weaver. Seen hanging beside her colorful ties, that once took fashionistas by storm, is a portrait of her daughter Amalia, painted by Luis Orozco. The other women soon followed suit and all together they managed not only to improve their family’s lot in life, but also to contribute to the island’s fortunes. The first sign of international recognition came in 1937, when the textiles of two Mykonian merchants – Theodoros Harakoulos and Taro Kodizas – won awards at the famed Exposition Internationale des Arts et des Techniques in Paris. After the temporary halt in all commercial and tourist activity imposed by World War II, Mykonian textiles made a comeback in 1954 and for the next 25 years or so experienced something of a heyday both within and beyond Greece’s border. The exotic adventurers and aficionados of all things traditional who visited the island at the time thirsted for anything authentically ethnic – and the ladies of Mykonos were not about to let them down. Working day and night, they turned Chora into one giant mill, with their 500 looms falling silent only on the eve of major holidays. Living rooms were transformed into working spaces and, thanks to their entrepreneurial spirit, the ladies were able to generate plenty of custom. Magazine and newspaper articles from that period show models, actors and celebrities walking around the streets of Chora in both simple and glamorous clothing procured from these homegrown “ateliers.” It’s said that Christian Dior, a renowned fan of Mykonos, used its textiles in his creations and even dedicated an entire line to them. Givenchy came to the island to dress his models, in cooperation with Joseph Salachas, a local tailor who built a stellar reputation. Greek designers like Jean Desses and Nikos&Takis drew inspiration from these crafts, too, and local creative spirit Yannis Galatis pioneered a new loose-weave technique. 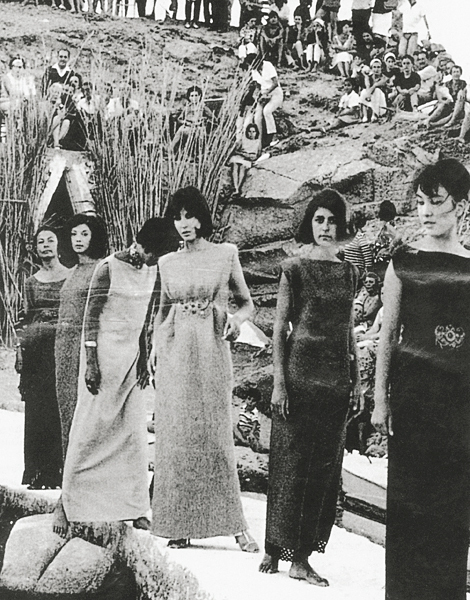 A 1967 outdoor fashion show by Mykonian designer Yiannis Galatis, presenting woven dresses to his international guests. 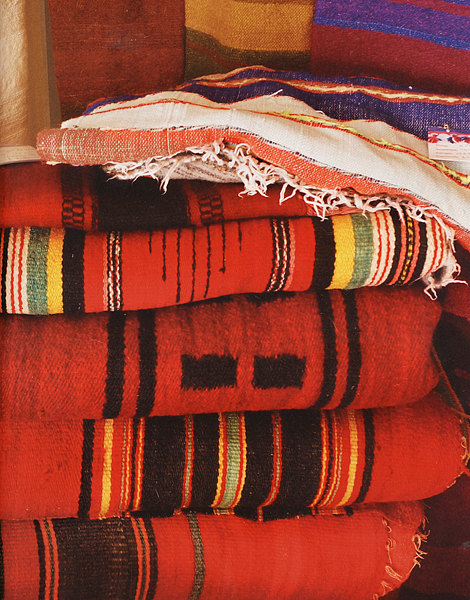 A stack of woven Mykonian blankets; heavy wool for winter, light cotton for summer. Mykonian weaving also influenced art. Painters, folk artists and craftsmen used pieces of textile to compose impressive tableaux or to construct dolls. The island’s fabrics were made into clothing, paintings, bed and sofa covers, curtains and tablecloths that graced not only trendy Athenian homes but even the royal palace itself. 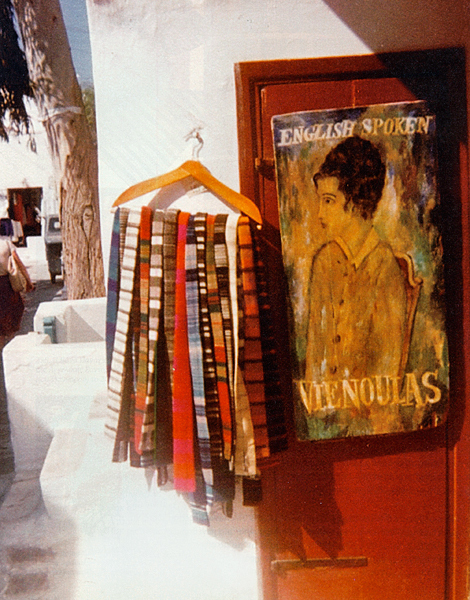 Cloth items became so ubiquitous on Mykonos that shirts, skirts and woven bags could be seen displayed alongside buckets, brooms and braids of garlic in convenience stores across the island. The craze for Mykonian textiles endured until industrialization finally caught up with the island. Cheap imports pushed down prices to the point where only a handful of weavers were able to make a living. The once-bustling ateliers were gradually transformed into brand stores and rooms-to-let, as the art of the loom perished. Today, the Mykonos Folklore Museum is the foremost treasurer of this tradition, showcasing 620 samples of the craft. 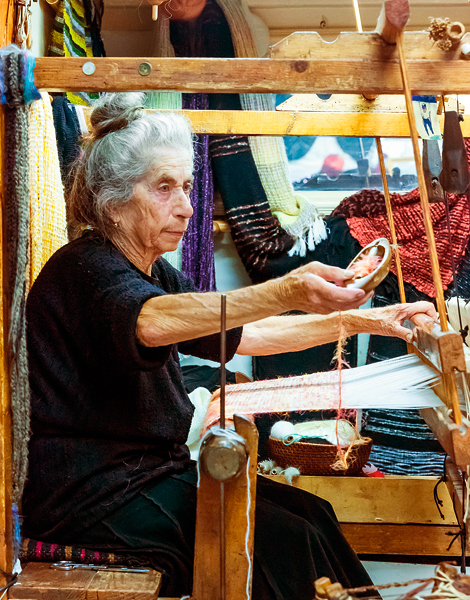 The tradition also lives on thanks to 73-year-old Niki Xydaki in Little Venice and 67-year-old Ioanna Zouganeli in Gialos who maintain the only two working looms on the island, attracting visitors not just with their beautiful wraps, but also with the ambience of a bygone era that can be found in their workshops. Now we can only hope that Zouganeli’s 7-year-old granddaughters – who often bicker over who gets the next turn at the spinning wheel – will carry on this tradition and, who knows, possibly bring it back to glory. *Source: Mykonian Weaving in the 20th century by Dimitra Sikinotou-Nazou & Panagiotis I. Hadjidakis. Special thanks to Dimitra Sikinotou-Nazou, a specialist in traditional arts and crafts, and particularly well-known for the dolls she makes. She has twice served as president of the Cultural and Folklore Association of Mykonos Women and is vice-chairwoman of the Friends of the Mykonos Folklore Museum Association. She works with the museum as a curator and also as a supervisor of the children’s art workshop program, where she teaches arts and crafts to children and adults on a voluntary basis.